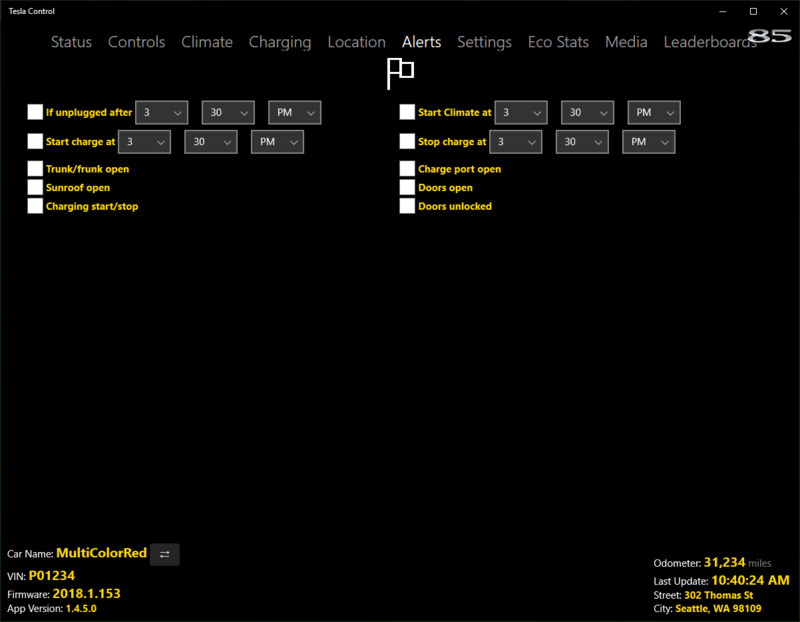 The Alerts screen provides access to a set of configurable Alerts and Reminders that can be enabled. The alerts are processed via a local Windows background task. This task runs approximately every 15 minutes. Plan alert start and stop times accordingly. The Alerts screen is enabled by purchasing the Alerts and Reminders add-on. This and all other available add-ons can be purchased via App Upgrades on the Settings screen. When enabled this alert triggers a notification if the vehicle is unplugged after the chosen time. When enabled this alert starts the climate system at approximately the chosen time. When enabled this alert starts charging the car, if plugged in, at approximately the chosen time. When enabled this alert stops charging the car at approximately the chosen time. When enabled this alert triggers a notification if the trunk/frunk are left open. When enabled this alert triggers a notification if the charge port is left open and the vehicle is unplugged. When enabled this alert triggers a notification if the sunroof is left open. When enabled this alert triggers a notification if any of the doors are left open. When enabled this alert triggers a notification, with the local time, when charging starts or stops. When enabled this alert triggers a notification if the doors are left unlocked.